One pound of human body fat made out of vinyl plastic is being sold online and it might make you want to start dieting. While we can't open our bodies, dive in and take out globs of fat tissue to see what it looks like, Anatomy Warehouse has the next best thing, as it's selling a full replica of what one pound of human body fat looks like in all its jiggly glory. Priced at $23, it's made of soft, pliable, long-lasting vinyl plastic, which oddly looks like oily jello. Dramatic three-dimensional visual replicas of human fat. A shocking but strongly motivating attention-getter. Made of soft, pliable, long-lasting vinyl plastic, this replica has a profound, memorable effect when passed among the audience. Replica represents approximate volume of real fatty tissue. 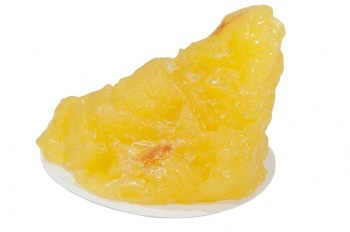 Physical weight of object may NOT be 1 Pound - The replica represents the volume of 1 Pound of fatty tissue on base. Made in the USA by Nasco. It might be a strange addition to someone's desk, but having this displayed in front of you might make dieting and getting rid of that unwanted fat a little easier. Regardless of your weight, the item might be a good conversation piece, though just don't blame us when people lose their appetite when they find out what it is.